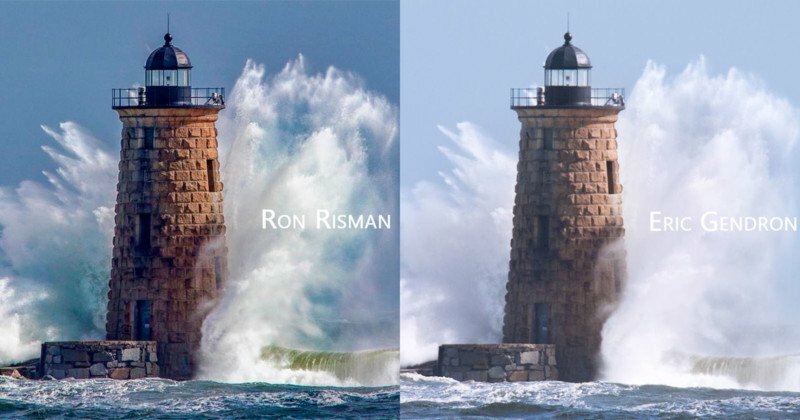 When Ron Risman posted a photo of the Whaleback Lighthouse in New Hampshire, a commenter accused him of ganking a photo just posted by Eric Gendron. When Risman saw Gendron's photo, he suspected he had ganked him: the two shots were seemingly identical. Close inspection of the waves and railings, however, show a slight deviation in perspective: the two men were barely yards apart when their shutters blinked in unison. I tried to make a pseudo-3D GIF (below) -- almost there! Perhaps it would work better with higher-resolution shots to align everything up more perfectly.